Holiday memories, I’ve got lots of them, from sitting in a train compartment on the way to Torquay, to docking in St Malo on the Brittany Ferry, and even the rainy days of North Devon decked in matching cagoules with my Sister as we checked out another ‘pretty little fishing village’. One holiday that does give me a lot of memories is the time we went to Sidmouth for a week, it would be the August of 1987 and I would have been aged fifteen. I have a memory for these kind of things, and another thing I have a memory for is the cars my Dad has owned! I don’t remember the Triumph Herald, but I do remember the old Triumph 1300 which was an awesome car. After that we moved onto a Hillman Avenger and then an equally superb Ford Cortina GXL (FNU 937L) which was simply magnificent. After that came a Vauxhall Chevette (YCH 147S), followed by another Ford Cortina (MLP 415V), but this time it was of the Mk 4 box style. Two Ford Escorts, the first being C925 OCH, and then the most modern car we’d ever had, the impressive F155 FNU, was to be the beast that took us to Sidmouth! At that time, I was massively into my football, I’d just got my first season ticket at Derby County following the clubs promotion to the old First Division under Arthur Cox, but at the same time I was still heavily into non-league football, watching Belper Town and anyone else for that matter when the Rams were away. Myself and my Dad hatched a plan before we went to Sidmouth, we wanted to get to a game, and as luck would have it, nearby Exmouth Town were at home to Minehead in the Western League. At the time Exmouth were a pretty potent force and had some success in the FA Vase, but not only that, thanks to the then programme editor at Belper, Stan Wilton, we had a contact at the club who was indeed Mike Blackstone who was also the programme editor at Exmouth. We met Mike at the game, and indeed the Chairman who’s name was Rod if I recall correctly, they were very hospitable and we ended up with some half time boardroom treatment. As for the game, it finished 4-1 to the hosts, and in terms of memories of the game, I have none whatsoever, other than the donkey’s that lived behind the goal! Sidmouth Town Football Club were not really on my radar at that moment in time, but that said, myself and Dad had a wander up to the ground one afternoon while Mum and Sister were out shopping. It was a public park with little or no facilities, so after a brief look, we turned round and went back into town. 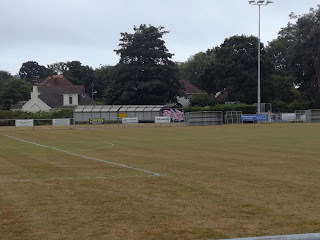 Just over thirty years later and with the family holiday in Devon booked, I was on the lookout for fixtures, and guess what, on the Friday night of the day we arrived, Sidmouth Town were at home to Chard Town. Mrs H did not take much convincing, she fancied a day in Sidmouth, we were on! The town of Sidmouth is as how I remember it, lovely, with its pebble and shale beach, and the River Sid that meanders through the middle of the town to the sea. After a very nice meal in a pub, where strangely enough I got chatting to a lad wearing a Sidmouth Town polo shirt, who turned out to be a player who was about to head off to the game, it was time to make the short journey ourselves. 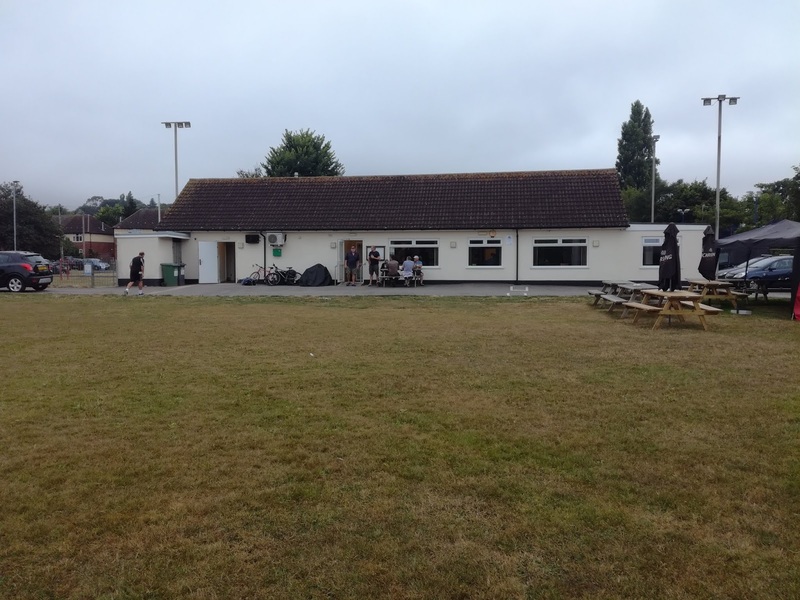 The ground was familiar in the sense that I recognised the footprint, set in a public park it now looks to have a clubhouse and changing room facility adjacent to a small car park, while the pitch itself is fully railed and has floodlights. 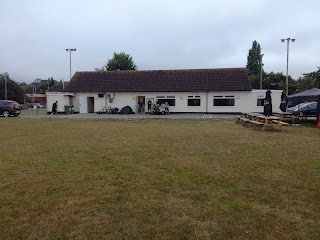 A small bit of cover has been erected close to the dugouts, but because it is located in a public open space it’s almost impossible to police the admission. 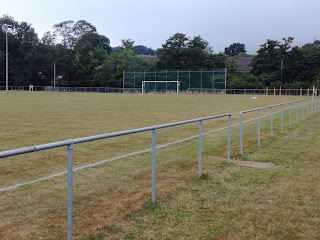 For a league game they take the money on the gate that leads to the car park, but various other entrances could be used for those too tight to pay. 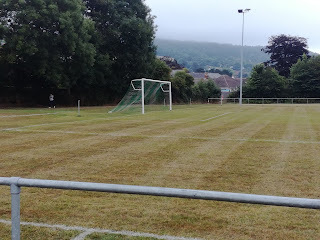 Sidmouth Town left the Devon & Exeter League in 2011 and joined the South West Peninsula League, First Division East, where they have remained ever since. After three seasons of struggle they have now become very much a mid-table side, but with former Barnstaple Town Manager Richard Pears now in the hot-seat, expectations will have been raised for the coming season. 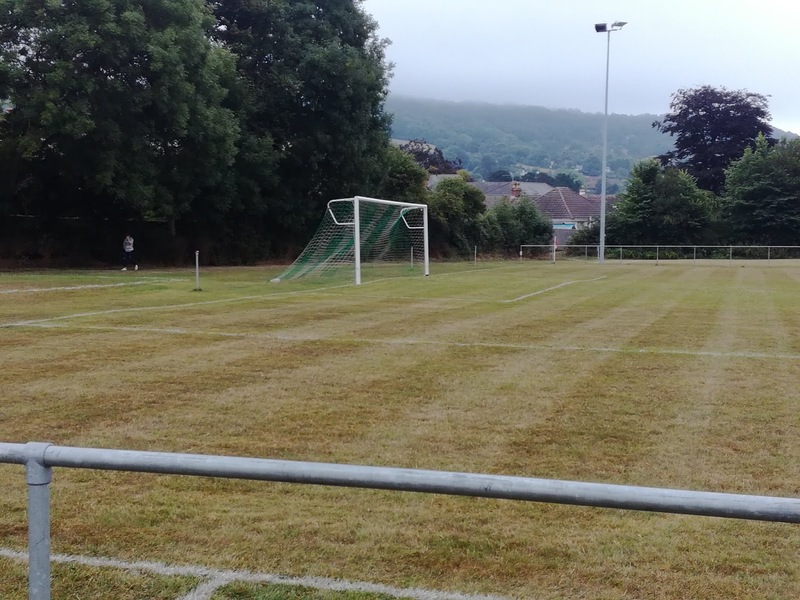 I’ll be honest, it wasn’t the greatest spectacle against Step 6 Chard Town, and it was the hosts who had the edge throughout the game and came out 2-1 victors on a night that turned a bit chilly following the showers of earlier in the day. Mrs H and young Master H were not overly enthused by the game and this didn’t bode overly well for my football plans for the remainder of the week, but that said, they’d enjoyed the day out, and that was what mattered.